Holy Night? Yes. Silent Night? Not exactly. If all you knew about the birth of Jesus was from department store Christmas carols, you might be tempted to think it was a serenely peaceful event – clean, pure, magical and not a trace of a tear (“all is calm”, “No crying he makes”). Likewise, Christmas TV programming typically consists of animated movies like The Polar Express, families dealing with their issues like The Santa Clause, or some other plot centered around Santa Claus inability to meet his deadline despite his alleged omnipotence. Aside from the question of the relevance of such things to Jesus, culturally the Christmas season is an emotional time of year, a time to relax, family times and full of light and fluffy accouterments. Now I think a bit of magic is great (perhaps necessary), adding a unique dynamic to the year, and we enjoy lots of good things but is the whole deal perhaps so clean, so neat, so magical, that the raw humanity of the arrival of Jesus is obscured? While it certainly doesn’t set out to be a Christmas movie in the traditional sense – and it’s probably more humanistic than Christian – Children of Men (2006) directed by Alfonso Cuaron (Gravity) is essentially a modern retelling of the Christmas story, and it might offer more insight into the squalor and hope of the traditional Christmas Story than our cultural sensibilities allow. 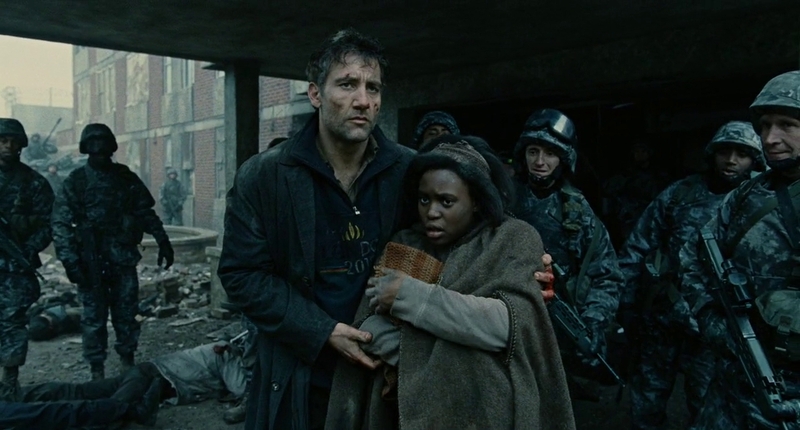 Children of Men depicts a world in turmoil, a world at war with itself, a world without hope, a world looking for hope. This world is a future one but the imagery is ours, and deliberately so, drawing out today’s problems to their worst conclusions: worldwide economic collapse, terrorism, horrifying refugee prison camps, police brutality, heightened security, pervasive surveillance. If the future didn’t look bright enough, a baby hasn’t been born in 18 years. On this day, the world’s youngest person, 18 year old “Baby Deigo” has died. The world is mourning and the title of the new youngest person goes to another. No one knows why. The future of a decaying humanity is brought into sharp focus. The hero Theo (Clive Owen), however, is disinterested, cynical. His life has been like this for some time, separated, alone. He drinks and smokes just to feel something. Theo’s wife, Julian (Julianne Moore) is a leader in an activist group called the Fishes. But with the group considered a terror organization, she needs Theo’s help to take young girl Kee to the coast. Theo, jaded though he is, finds himself caught up in the plight to protect and defend the baby who is – or rather could be – the hope of the world, if only they can survive a desperate and dangerous escape from those who would take the baby for their own ends. He’s the only hope for the only hope of the world. Like Mary and Joseph, Theo and the pregnant Kee endure an arduous journey with an impending birth. Eventually, Kee and Theo are forced to find a place in the poverty of a refugee camp. It isn’t much. It’s dark, filthy, unhygienic. But in this filthy place, a baby is born. We experience all the sweat, breathing, pain and desperation, as this new, living, breathing, crying life emerges in squalor. It’s a traumatic scene set in a world wracked with despair and decay. But it’s also a beautiful human moment of great joy, pregnant (pardon the pun) with possibility. It signals the beginning of hope for Theo – who through this journey is transformed from apathy to action – and the hope for humanity. And this too is the irony of the incarnation of Emmanuel, God With Us. The arrival of this Son – to ordinary parents in a lowly animal shelter, through the pain and messiness of childbirth into our dirt and grime, to a people oppressed and a world aching under the weight of sin – signals the beginning of hope; the joyful angelic proclamation of peace on earth and goodwill among men announces the dawn of a new day between God and humanity. While Jesus’ birth signals the hope of a new beginning for humanity, Jesus ultimate sacrifice secures it. At the cross, Jesus will again be humiliated, the joyous songs of angels are exchanged with the mocking of scoffers, his body once small and supple, now beaten and torn for the sins of many. Not the liberator from Roman oppression as some hoped, but the victor over the slavery of sin and death. Yes, we need action rather than apathy. But we first need transformation. Forgiveness of sins. A new heart. A heart that puts others first. If the darkness within is conquered, the darkness without will follow, in our lives and in our world. Children of Men is not your usual Christmas viewing, but maybe it should be. Maybe not in a family time slot – much of the story is too intense for young viewers, and probably many older ones too. If the message of Children of Men is that hope can emerge from the deepest darkness, the Christian message is that hope has appeared in flesh and blood, but it doesn’t always look like what we expect.